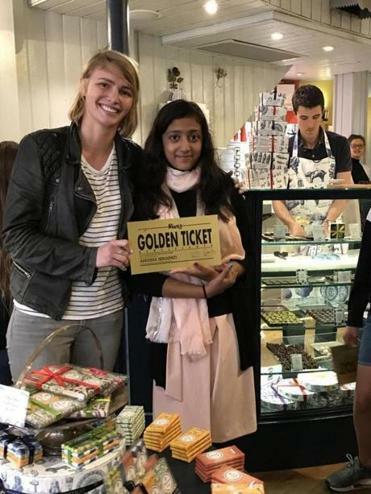 Anusha Senapati of Acton received a golden ticket from Roald Dahl’s granddaughter, Chloe Dahl. Roald Dahl’s Imaginormous Challenge invited children aged 5-12 across the country to submit their most imaginative story ideas in 100 words or less for the chance to win, like Charlie Bucket in “Charlie and the Chocolate Factory,’’ one of five golden tickets. Out of over 20,000 entrees, 11-year-old Anusha Senapati of Acton was awarded one for her tale of a paralyzed girl who longs to dance. In Senapati’s case, her story was adapted for the stage by the cast and crew of “Charlie and the Chocolate Factory.’’ Senapati, whose favorite authors are J.K. Rowling and Dahl, says winning made her feel “like the luckiest person in the world.” A golden feeling, indeed. Next year marks the 150th anniversary of Louisa May Alcott’s beloved novel “Little Women,’’ which chronicles the lives of a quartet of sisters who come of age in Civil War-era Massachusetts. “The Other Alcott’’ (William Morrow), a new novel by Elise Hooper, reimagines the story of Amy March, the spoiled and selfish youngest sister. The character of Amy was based on Alcott’s youngest sister, May, and Hooper, who grew up near Alcott’s home in Concord and now lives in the Pacific Northwest, found herself wondering what it would be like to be portrayed so negatively by your older sis. Hooper’s novel explores Amy’s artistic pursuits, as she studies in Boston, Paris, Rome, and London, as well as the complicated tangle of love and tension involved in sibling dynamics. The Massachusetts Literary Education and Performance Collective is hosting a book launch and fund-raiser celebrating the publication of a new collection of poetry, “Electric Arches’’ (Haymarket), by Eve Ewing, a poet, academic, and chairwoman of MassLEAP’s board. The book, which combines art, poems, and prose, both real and surreal, explores gender, race, and what it means to be a girl and a woman. An arts and social-justice nonprofit, MassLEAP works to broaden and support spoken-word and slam poetry for young people. The event will take place on Saturday, Sept. 30 at 7 p.m. at Make Shift Boston, 549 Columbus Ave.; tickets are $20.